Are you a Keno player? Perhaps you want to check out this lottery-like pastime but not have to get involved with live callers and the slow rate at which those games unfold. 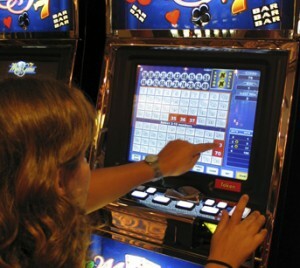 Live Keno games generally take around five minutes to play – pick your numbers, mark them off as the numbers are revealed, etc. If you’d like something a little quicker then rattling through ten games per minute on a video Keno machine might be what you’re looking for. Of course ten games per minute is at the extreme end of things but video Keno offers players the chance to play at their own pace and at their own betting denomination. Picking numbers playing video Keno. It’s very easy to get started and the rules are just the same as live Keno. Pick the machine which suits your budget and insert some credits. Now all that’s left is to press the button on the screen to start the process and pick the numbers you want to match – usually between 1 – 10. Sometimes you will encounter multi-card machines which let you play with more than one card. Now watch as the numbers are drawn automatically and marked off on your card. If any match your numbers they will be highlighted and when the round is over any wins will be paid out. You can now repeat your bet or clear the screen and start again. If you want to play ultra-fast games then there are options to speed up the process. Use the ‘Autopick’ facility to quickly pick the required amount of numbers and then use the ‘Instant Draw’ facility to immediately reveal all 20 drawn numbers. In this manner, games take a matter of seconds rather than minutes. Lastly we would like to reiterate the fact that Keno is one of the worst casino games you can play in terms of the high house edge so playing more games faster is just a way to lose your money more quickly.